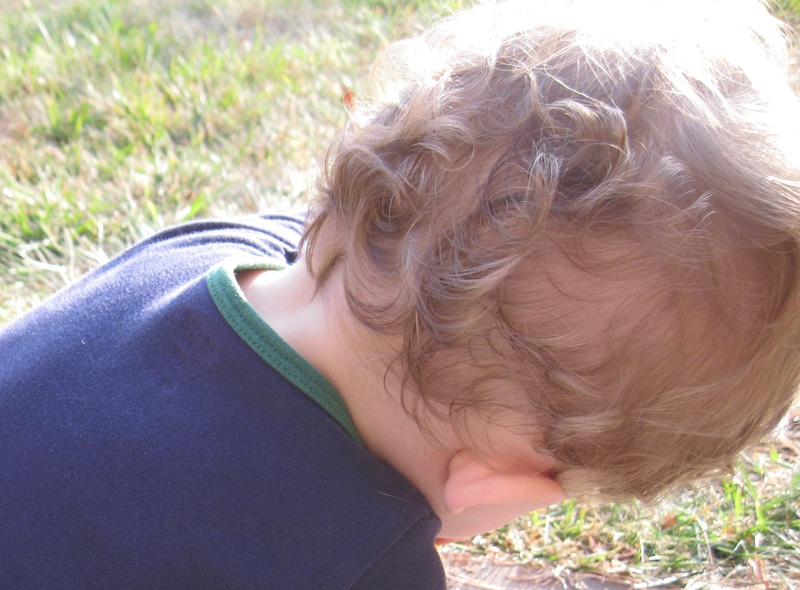 I am addicted to the back of my son’s neck. I first noticed it several months ago, long after he’d lost the newborn scent. I must have been rubbing his hair dry after bath, or tickling till he squealed with glee, or wrestling around on the floor as he tried to crawl away. I buried my nose in the back of his head to give him a kiss and breathed in deeply, and I was astonished. It didn’t smell like shampoo or lotion, like sweat or tears, like food or playdough or paint (or anything worse) that I often find smeared in his hair. Nothing of the normal eau-de-bébé. It simply smelled pure. Fresh. Warm. Holy even. Right in the curve between the muscles at the nape of his neck, such a small soft space, was buried this primal scent of possibility. All I can think is it smells like God. I know it sounds clichéd, comparing baby’s sweetness to perfection of the divine. Too easy a metaphor, too saccharine a simile. Yet every time now I swoop in to nuzzle his neck, trying to find the familiar mysterious scent, hoping to inhale before he chuckles and pushes away, it smells exactly the same. It smells like God. But I’m only sure of this because I know God doesn’t always smell so sweet. I remember ripping urine-soaked sheets off Philippe’s bed every morning at L’Arche. God smelled like that, too. I remember scrubbing burnt food off the bottom of giant steel pots at the soup kitchen. God smelled like that, too. I remember coughing outside with the women from the shelter as they escaped for a cigarette and conversation. God smelled like that, too. Whenever I catch a whiff, it’s a surprise, pure recognition in the moment, something primal that hits my senses all at once, a memory too far back to trace, but something I know. The smell of God. Sometimes grimy hands and sweaty limbs and dirty floors and filthy laundry. And sometimes soft hair whisper, baby-neck sweet. I’m a full-blown addict now, craving my next hit, scheming and plotting to distract the baby so he’ll turn and I can sneak another sniff. I don’t know how much longer he’ll hold on to the scent; how quickly we lose the purity, dirty it up with everyday muck or overclean till it reeks too sweet. It won’t last forever; this much I know. And I don’t know how long I’ll have to go before I smell God again. For now I breathe it in everyday, when he’ll let me. A deep breath or a secret sniff and I remember all over how earthly an incarnate God can become. And I wonder what small spaces within my own body – hands, feet, limbs, neck – might still hold some trace of the original. Your post leaves me a bit speechless, in the best sort of way. The odor of sanctity; it comes in many forms, but means only one thing. God is present. Amen. Isn’t that true, Fran? Amen indeed. Do you know what I love about your posts? They are so completely incarnational. They are about our bodies. They are about God in our bodies, as one of us. That is a reminder I need more often than I care to admit.